chariot is the 7th card in tarot card and associated with the astrological sign of Cancer.This card represents the seven degree of initiation. The four pillars and the blue top with the stars represents the whole world. Moving on the seventh card we can say that the fool is now in command of worldly success. The chariot represents the progress; the fool is now trying to move forward keeping a vision.The city is behind him, indicating he has turned his back on civilization and materialism in order to seek spiritual matters. 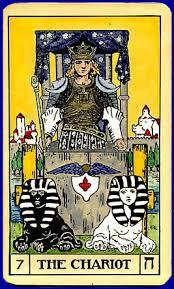 This means you are talking the chariot of life in your own hands and take the responsibility of your own deeds. It can imply inner conflict from the two pulling directions and represent one's own aggressive and competitive drives.